Polenta is so easy to make and goes well with so many things. I seem to gravitate towards tomatoes to cut the richness of the polenta. Feel free to use your choice of meatballs, vegetarian or not. The day after, with any leftovers, form into discs, coat in panko and pan-fry for a tasty alternative. Bring water to boil, add salt. Slowly whisk in corn meal, cover and reduce heat to medium-low and cook 20 min, stirring every 5 minutes. Off the heat stir in butter, milk, cheese and basil. Cook for 20 minutes covered. In large fry pan over high heat, add olive oil and mushrooms. Stir to coat mushrooms in oil the leave alone 5 minutes. Stir and reduce to medium-high cooking another 5 minutes. Add balsamic and cook another 1 minute. Remove from heat, add soy sauce and lemon. 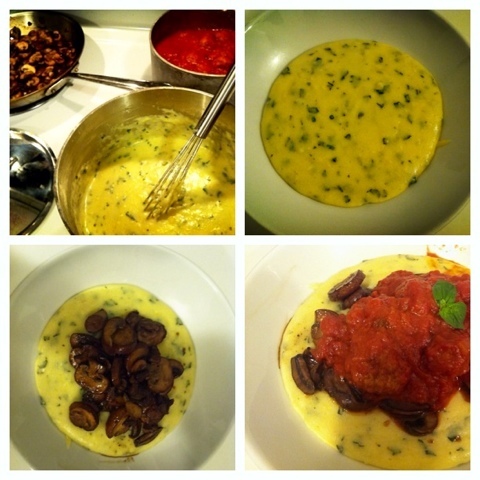 Assemble by layering polenta, mushrooms then tomato braised meatballs. Serves 5.